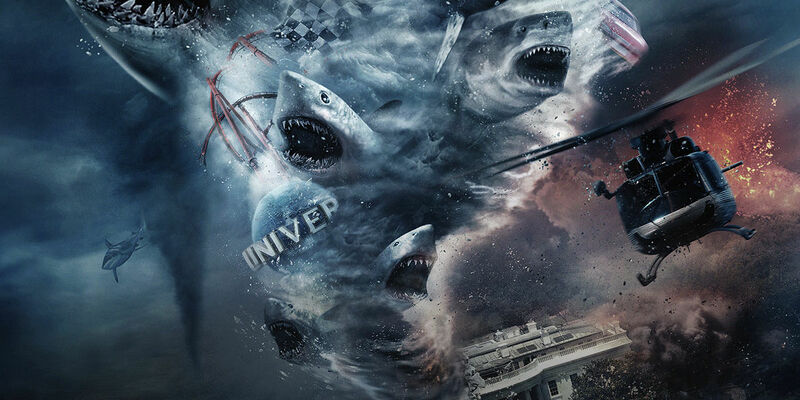 Two years ago, SyFy struck gold with their creature feature-meets-disaster B movie, Sharknado, which posed the question of what would happen if ravenous sharks were combined with a deadly tornado. The TV movie attracted the interest of many on social media and became a viral success for the network after celebrities like Wil Wheaton (The Big Bang Theory) and Damon Lindelof (The Leftovers) chimed in with their reactions. Last summer, the feature was followed up by Sharknado 2: The Second One, and a third title was added to the series with this summer's Sharknado 3: Oh Hell No! In Sharknado, ex-surfer/bar owner Fin Shepard (Ian Ziering) battled the scientifically-impossible superstorm that hit L.A., saving his ex-wife April Wexler (Tara Reid), their children, and his coworker Nova Clarke (Cassie Scerbo). For Sharknado 2, Fin and April fought a double-sharknado in New York City and in the third installment the pair reunite with Nova as a sharkicane hits the east coast - or, should we say, Feast Coast? Sharknado 3: Oh Hell No! reteams director Anthony C. Ferrante with screenwriter Thunder Levin, the pair responsible for Sharknado 1 and 2. On screen, the heroes are joined by David Hasselhoff, Bo Derek, Ryan Newman (Zoom), Jack Griffo (The Thundermans), and Frankie Muniz (Malcolm in the Middle). Plus, Mark Cuban and Ann Coulter portray the President and Vice President of the United States, respectively. While The Second One featured plenty of celebrity cameos - including original fan, Wheaton - Sharknado 3 offers even more appearances from the worlds of film, television (including reality TV), politics, sports and music. There are enough celebrity cameos that they may even outnumber the sharks; to name a few: the original Hulk, Lou Ferrigno, A Song of Ice and Fire writer George R. R. Martin, WWE star Chris Jericho, magicians Penn and Teller, and hosts of the Today Show Kathie Lee Gifford and Hoda Kotb. The Sharknado movies are some of many titles from The Asylum, a production company that focuses on low-budget, direct-to-video features like Mega Python vs. Gatoroid and Mega Shark Versus Giant Octopus. The Asylum has also become known for its "mockbusters," parodies of bigger-budgeted action films, such as Avengers Grimm, a mashup of concepts from The Avengers: Age of Ultron and Once Upon a Time. In that vein, Sharknado 3 certainly delivers an even bigger adventure than the previous films, even simply in terms of space. Each Sharknado film has followed Fin as he gathers his family for a final showdown with the shark-infested storms. However, while the first took place in Los Angeles and the second in New York City, Sharknado 3 spans the east coast from Washington D.C. to Cape Canaveral - and even extends into space. That being said, much of the TV movie takes place in the Universal Studios Florida theme parks, with plenty (read: minutes-worth) of establishing shots to make sure viewers know exactly where the heroes are battling the sharknadoes - that is, if using the Universal globe to mow down sharks wasn’t enough. Along with other advertising plugs for Comcast personalities and products, Sharknado 3 is a far cry from its low-budget, independent roots. Of course, there are still plenty of new and improved aspects in Sharknado 3 that will surely entertain fans of the first two movies. The performances are exactly what viewers would expect from a B movie, or any Sharknado film; they aren’t why fans are tuning in. Additionally, for all its product placements, Oh Hell No! also delivers many jaw-dropping and largely unforgettable moments. Certainly, it wouldn’t be a Sharknado movie if Fin didn’t dive headfirst into the mouth of an extra-large shark - though he isn’t the one cutting his way out of the beast’s stomach this time. New to the Sharknado series, though, is the cliffhanger ending of Oh Hell No!, which asked viewers to chime in on Twitter to decide the fate of a main character. While SyFy requested fan input when naming Sharknado 2 (they settled on The Second One), the series is taking the Choose Your Own Adventure route in terms of whether the main cast survives this particular storm. This may be too much for certain viewers, but those that enjoy the second-screen interaction on Twitter will certainly appreciate the opportunity to offer their opinion. Still, though Sharknado 3: Oh Hell No! delivers bigger stakes, more sharks, more gore, more cameos, and more interaction with its viewers, the third installment to the series is a serious departure from what was appealing about the original. Sharknado struck a delicate balance between charmingly self-referential jokes, with its many nods to Steven Spielberg’s Jaws, and unassuming low-budget horror. Even more than that, though, Sharknado became a one-night cultural phenomena that seems near-impossible to achieve again. Now, Ferrante and Levin have proved they can keep the Sharknado series going long after many thought it would be dead in the water - Sharknado 4 has already been confirmed - and even entertain fans with bigger, more shocking moments. But it’s unlikely they’ll be able to return to the low-budget roots of the first film. Plus, though they may attempt to recreate or improve upon it, Levin and Ferrante cannot top the moment from Sharknado when Fin dives into the shark to save Nova and cuts his way out. Sgt. Warren: I really hate sharks.Lucas: Could be worse, could be zombies.